Nashua, NH – When Long Island resident, Jeep enthusiast and long-time NH Liquor & Wine Outlets customer Eric Christensen made his usual mid-summer stop at the NH Liquor & Wine Outlet on I-95 North in Hampton, he expected to stock up and save on his way to a family camping vacation in Maine. Little did he know the custom 1948 Custom Sailor Jerry Jeep Willys Overland Wagon on display from Motorland would someday be parked in his driveway. In March the representatives from the NH Liquor Commission and Sailor Jerry Rum handed over the keys to Christensen, the first-ever winner of the NH Liquor & Wine Outlets / Sailor Jerry Rum Summer Promotion. For the past ten summers the resident of Center Moriches, Long Island and owner of a small dental practice and his wife have stopped at the NH Liquor & Wine Outlet on I-95 North in Hampton on their way to a vacation at Acadia National Park in Maine. On his most recent trip, the custom Sailor Jerry Jeep featured in the Sailor Jerry Rum Summer Promotion caught his eye. Christensen declined to enter the raffle at first thinking there was no chance of winning the vehicle. That was until his father-in-law urged him to enter the contest over dinner one evening. Heeding his father-in-law’s advice, Christensen entered online. 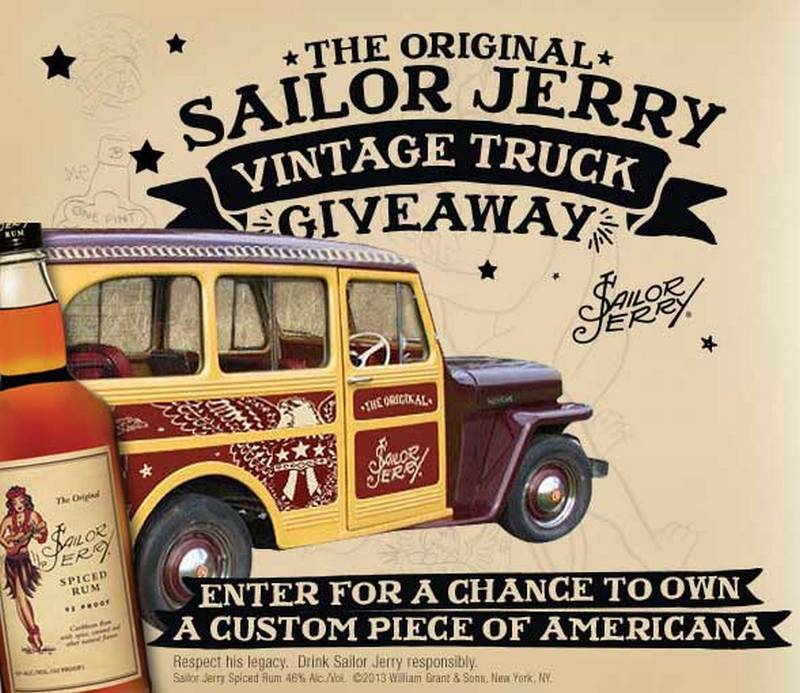 The Sailor Jerry Rum Summer Promotion generated thousands of entries and the winner was selected on what would have been Norman “Sailor Jerry” Collins’ 103rd birthday. The grand prize custom Sailor Jerry 1948 Jeep Willys Overland Wagon is a true American classic modeled after one of the first steel bodied wagons produced after World War II. The “Tin Woody” has an original drive train with an approximate retail value of $15,000. Christensen is known in his small Long Island community as the ‘orange Jeep guy’ because of the modified and highly visible bright orange Jeep Wrangler parked outside of his small dental practice. A long-time Jeep enthusiast, he has owned several Jeep vehicles and always wanted to buy and restore a Willy. The orange Jeep has attracted several patients and he anticipates the site of the Sailor Jerry Jeep Willy will do the same. Norman “Sailor Jerry” Collins (1911–1973) is the father of old-school tattooing and considered by many to be the foremost tattoo artist of all time. He developed his craft in a time and place where hard work and sacrifice were deeply valued. Sailor Jerry tattooed thousands of the military men who passed through Hawaii, playing a prominent role in shaping US military culture in the Pacific Theater during World War II. A small mom and pop clothing company was founded by fans of Sailor Jerry to keep his legacy alive and out of the ambition to create something as iconic and enduring as Sailor Jerry’s artistic legacy, Sailor Jerry Rum was created based on the spiced rums created and drank by sailors (to improve the taste of on-board rum rations, sailors would spice it with ingredients from the ship’s galley). Sailor Jerry continues to thrive as a lifestyle brand with an ever increasing base of loyal fans and advocates. North Atlantic Signs and Sailor Jerry Rum from Reginald Groff III on Vimeo.